We'd like to invite you to join our "The Old, The New and The Super Models of DrayTek" webinar next Thursday, April 19th @ 11am CDT. This webinar will be very beneficial to you and your company, as our CTO, Henry Castillo, will discuss what makes DrayTek the perfect network solution for a variety of SMB applications. He will present new products, new favorite router series, and future super models as well as explain the differences with soon-to-be discontinued popular models. Whether you want to add redundancy to your network, security to your campuses, VPNs for your remote workers or get the most out of your wireless and VoIP installations - DrayTek multi-tasking solutions offer business-features with no hidden costs or complex licensing. 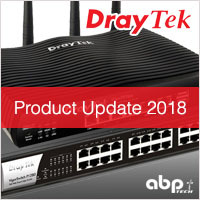 It's no wonder that network professionals around the globe swear by the dependability and ease of DrayTek solutions; we hope you'll join this webinar to discover why and find out more about how you can save thousands in installation, support and maintenance by switching to DrayTek.